There is a farm market I pass on the way home from work now every day. They’re open year-round but I started going there in May to pick up local produce for the weeks when I wasn’t going to Wegman’s. The produce at the other grocery stores is abysmal at best. Sometimes I seriously wonder how they get away with selling strawberries that are bruised or moldy or lettuce that is so limp you know it past it’s prime last week. Anyway, one thing I immediately noticed at the farm stand is that they have a tub of arugula for $2. 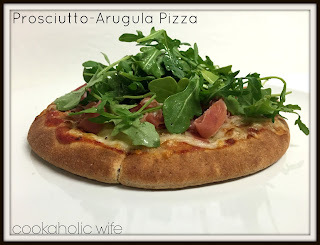 I never used to like arugula, thinking it just didn’t taste like lettuce. Well, it doesn’t taste like lettuce, it has a distinct peppery taste and sometimes has more hints of a bitter note than others. My tastebuds changed over time and now I could honestly eat an arugula salad nightly. I also have a deep love for prosciutto. It comes in 2 and 4 oz. packages here and there have been nights where I’ve intended to eat a slice and then end up eating the entire package. Anyway, combining arugula with prosciutto is like my current heaven of choice so this recipe was a no brainer. 2. Divide the pizza sauce and spread evenly onto the pita pockets. Sprinkle with garlic powder and crushed red pepper. 3. Divide the cheese between the two pita pockets. Then add the prosciutto on top. Bake for 10-12 minutes or until the cheese has melted, the prosciutto is crispy and the pita is toasted on the bottom. 4. Meanwhile, toss together the arugula with olive oil and lemon juice. 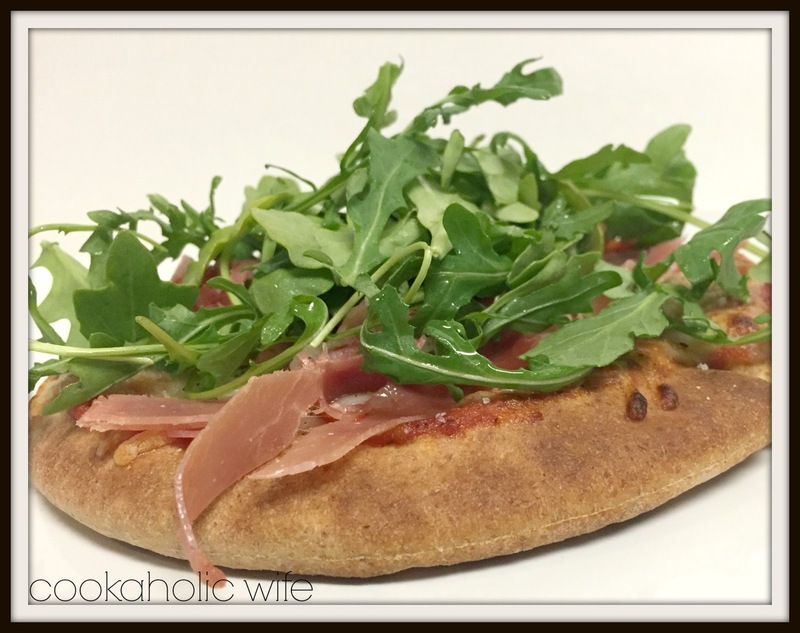 Once pita pizzas are removed from the oven, divide the arugula on top of each and cut in half to serve. The pita pockets I bought came 6 to a pack. I may have ate two of these a night for three days in a row. This is definitely one of my ultimate snacks or meals that requires very little preparation and cook time.